Ninety-six football fans who died as a result of a crush in the 1989 Hillsborough disaster were unlawfully killed, the inquests have concluded. The jury found match commander Ch Supt David Duckenfield was "responsible for manslaughter by gross negligence" due to a breach of his duty of care. Police errors also added to a dangerous situation at the FA Cup semi-final. The prime minister said the inquests had provided "official confirmation" fans were "utterly blameless". 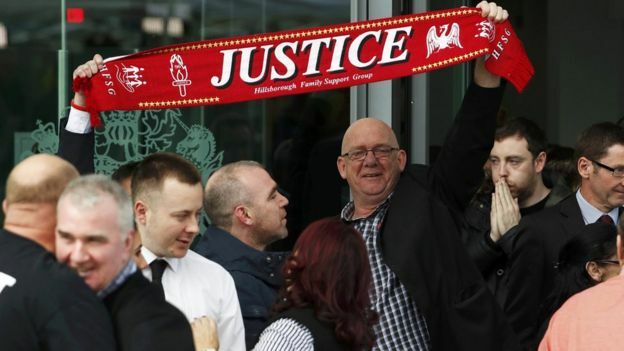 After a 27-year campaign by victims' families, the behaviour of Liverpool fans was exonerated. The jury found they did not contribute to the danger unfolding at the turnstiles at the Leppings Lane end of Sheffield Wednesday's ground on 15 April 1989. Nine jurors reached unanimous decisions on all but one of the 14 questions at the inquests into Britain's worst sporting disaster. The coroner Sir John Goldring said he would accept a majority decision about whether the fans were unlawfully killed - seven jurors agreed they were. When considering how each of the 96 victims died the jury concluded many died well after 15:15 on the day of the match. The coroner at the original inquest, Dr Stefan Popper, said he would not hear any evidence relating to deaths beyond that time because he believed all the victims had died, or suffered fatal injuries, by then. The new inquests jury found the direct medical cause of death was compression asphyxia in all but three of the victims. The earliest time of death was estimated at 14:57 and the last up to 17:00. Tony Bland, the 96th victim, died in 1993 after being left brain damaged, due to or as a consequence of compression asphyxia. The families clapped as the jury left the Hillsborough inquests in Warrington. One woman shouted "God bless the jury." 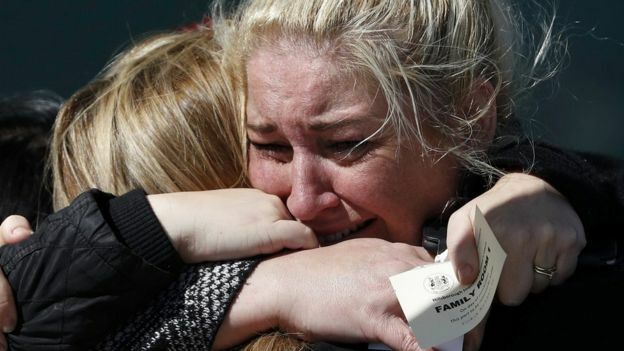 There were lots of tears as lawyers hugged the families and the shadow home secretary Andy Burnham hugged the families in court. 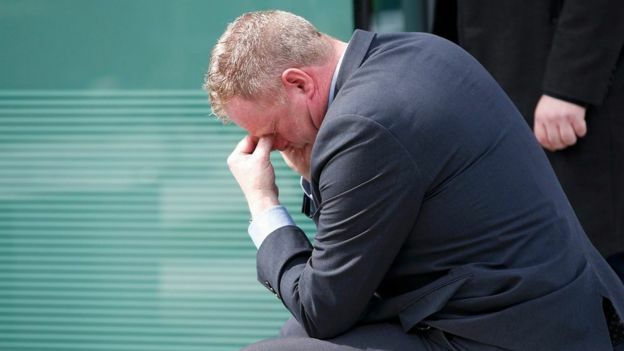 There were lawyers crying, Andy Burnham was crying and the families were hugging. People said they couldn't take in the enormity of it all. Trevor Hicks, whose daughters Sarah and Vicky died, told me: "We've done it." A spontaneous chorus of "You'll Never Walk Alone" was sung outside the courtroom as people raised Liverpool flags above their heads. 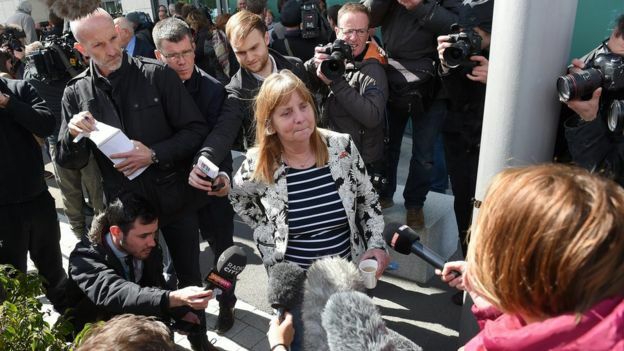 Leading campaigners Margaret Aspinall and Trevor Hicks were seen hugging each other in tears. 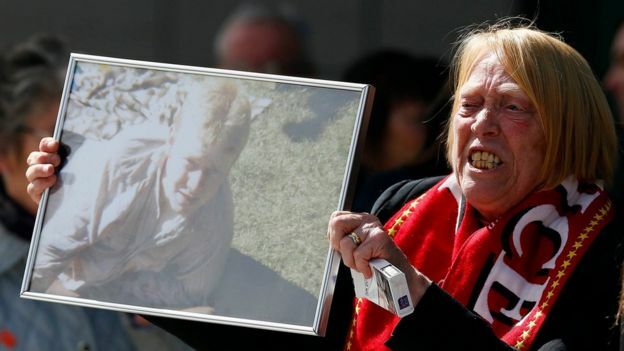 Ms Aspinall, whose 18-year-old son James died in the disaster, said: "I think we have changed a part of history now - I think that's the legacy the 96 have left." Barry Devonside, father of Christopher who died aged 18, said: "I never thought in my wildest dreams that we would get this decision. "We did our best - we couldn't do any more." A statement on behalf of all of the families said the jury's conclusions "completely vindicate" the long fight for justice. It added it has brought "significant progress on the journey... and sense of closure to the bereaved". Prime Minister David Cameron called it a "landmark day" and said the inquests "provide long overdue justice". He said: "All the families and survivors now have official confirmation of what they knew to be the case - that the Liverpool fans were utterly blameless in the disaster that unfolded at Hillsborough." Current SYP Chief Constable David Crompton said the force "got the policing... catastrophically wrong". He said his force "unequivocally" accepts the conclusions of unlawful killing and the wider findings. "As I have said before, I want to apologise unreservedly to the families and all those affected." At a later press conference, the Hillsborough Justice Campaign - which is made up of 22 of the bereaved families - called for Mr Crompton's "immediate resignation". Stephen Wright - whose brother Graham died in the disaster - said: "The five South Yorkshire Police legal teams simply pursued the denials of the past, blaming mythical late, drunken, ticketless fans for the deaths of our loved ones. He added: "Mr Crompton has not only let the police force down but also the general public. He has also let down rank and file police officers, many of whom did their best on the day of the disaster and were themselves traumatised." Elkan Abrahamson, one of the Hillsborough families' solicitors, said it was "shameful" that SYP and the ambulance service had fought "tooth and nail to avoid adverse findings by the jury" adding, "this turned the inquests into an adversarial battle that took twice as long as it should have done". The police response to the increasing crowd outside the Leppings Lane turnstiles at Liverpool's match against Nottingham Forest was "slow and uncoordinated", the inquests in Warrington, Cheshire, heard. The road closure "exacerbated" the situation and there were no filter cordons in place to regulate the movement of spectators. Attempts to close the perimeter gates were made too late and there were no contingency plans for the "sudden arrival" of a large number of fans, the jury said. Jurors concluded the commanding officers should have ordered the closing of the tunnel which led directly to the central pens where the fatal crush occurred. The SYAS failed to establish the nature of the problem at the Leppings Lane end, the inquests heard. The jury said the failure to recognise and call a major incident led to delays in the emergency response. Jurors concluded those mistakes contributed to the loss of lives. In addition, faults with the design and layout of crush barriers within the stadium were highlighted. There was a lack of dedicated turnstiles for individual pens and there were too few for a capacity crowd, the inquests were told. "A lot of evidence has come to light here and in the police investigation. The inquest has done its job and now the criminal justice system takes over. "They [Independent Police Complaints Commission (IPCC)] are looking at both organisations and individuals. The unlawful killing conclusion that we have had today the route to it was considering the actions of match commander David Duckenfield. "The Crown Prosecution Service (CPS) can consider a prosecution against David Duckenfield." The CPS said it would "formally consider whether any criminal charges should be brought against any individual or corporate body based upon all the available evidence". A criminal investigation into the disaster, Operation Resolve, is being led by Assistant Commissioner Jon Stoddart. Jenny Hicks, whose teenage daughters Sarah and Vicky died in the disaster, said: "I hope this is an opportunity for John Stoddart and his team, the IPCC and the CPS to look at the results of this inquest and take it as an opportunity to move it forward onto some kind of accountability. "That's what I'd like to see [because] you can't have, to me, conclusions like this and not have some kind of accountability for those 96 innocent deaths."